For those of you who are just joining me, this is my record of my effort to 'cure' my acne problems with the help of the Simplicité skincare range designed for acne-prone skin. I am back with another Simplicité report, as well as answers to some of the questions that I asked Robin in my last update. It has now been 7 weeks since I first started my Simplicité skincare routine (boy, does time fly!) and here are my updates. I was also sent the Exfoliating Face Treatment - which I think is one of my absolute favourite products in this range, aside from the Rosehip & Lavender Complexion Refiner and the Antibacterial Serum. It is a multi-purpose product that can be used as an exfoliator and as a mask to help heal acne and reduce redness. It is quite exciting what this range has done for me in terms of radiance. I have much brighter skin, so much so that it boosts the radiance and luminosity of any foundation that I apply. I don't need highlighters anymore (though I still love to apply them when I go out at night). I love the fact that the range has products that really, truly complement one another. For instance, the One Step Exfoliating Cleanser loosens blackheads and brings out any underlying congestion in the skin. To counteract this, you can use the Rosehip & Lavender Complexion Refiner to further loosen and remove the blackheads. Using the Exfoliating Face Treatment to then draw out and encourage the healing of the blemishes that surface from the congestion. 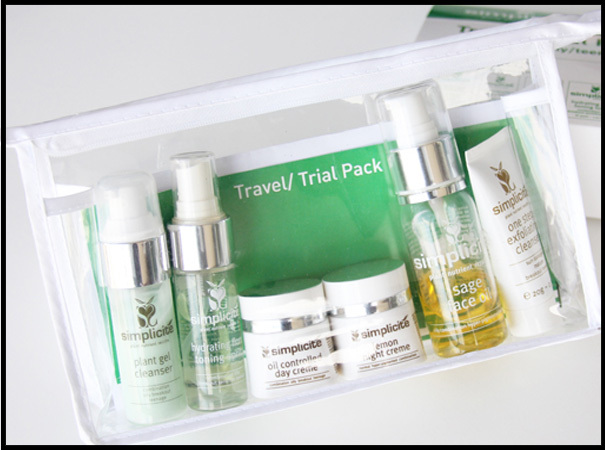 Simplicité also encourages the use of their serums underneath their masks to further infuse the products into your skin. A perfect combination of products! I used to have normal-sized blemishes (mostly without heads) which would go away quickly but leave annoying scars that would last for months on end. A huge relief that came with the use of this skincare range is that now, those blemishes never appear anymore, and the scars have started to lighten. Now, my skin has developed these tiny little blemishes (I've never had blemishes so small!) as well as bumps all over. Particularly on my chin as well as near the nose, underneath my eyes. I brought it up with Robin, who says that it is normal, because the One Step Exfoliating Cleanser is drawing out all underlying bacterial congestion, which I can clear out slowly with the Exfoliating Face Treatment. It takes a while for me to get my oiliness in check, especially when I switch skincare (which, in my time as a beauty blogger, happened very frequently). The range has currently got my oiliness in perfect balance - by the end of the day all that happens is my face looks a whole lot better and more dewy. A few weeks into using this range, my forehead was still extremely dry and even flaky. I started concentrating the Sage Face Oil and both my morning and night moisturisers in this area and the skin there is now much better. What you’re using at the moment will give you anti-aging benefits – at the same time helping to clear the acne. The Antibacterial Serum for example helps to increase elasticity and firmness of the skin – amazing but true. After a few months when the breakouts have calmed down (we’ll see if you need to take the capsules at some stage) you can start using another serum. Use this before the face oil. I would suggest the Antioxidant Plant Serum for its benefits for improving the appearance of any scarring. This serum is entirely formulated of 13 concentrated antioxidant extracts – it increases the vitality and health of the skin, helps prevent skin cancers forming and works to reduce existing damage.